Adey Steel is a leading UK specialist steel fabricator serving the Rail, Infrastructure and Engineering industries. 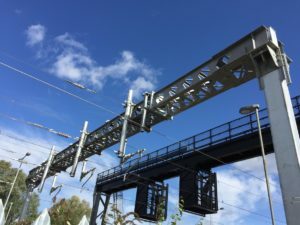 Our business supplies to Network Rail, Tier 1 and Tier 2 contractors for large national infrastructure projects and has a reputation for consistently high quality, outstanding service and an industry leading safety record. Products supplied consist of: OLE Structures, Signal Gantries, Pedestrian Bridges, Small Part Steelwork, Bespoke Fabrications, Piling, Depot and Station Structures. We are accredited to Execution Class 3 under BS EN 1090 CE Marketing Positioning us amongst the most capable fabricators across the UK. We operate to ISO 9001 quality standard, OHSAS 18001 health and safety, RISQS accredited and have a strong focus towards continuous improvement and lean manufacturing.